Cats tend to sleep and sit on the stranges places, like your laptop or a cardboard box. But what if your cat wants something more exclusive and trendy? These are some amazing options for cat beds, cat pads and cat homes! The wooden finish and the clear white front will look great in any designer home, and the inside is fluffy and cozy just like mr. Kittens likes it. With it’s removable front and back panel it is even easy to clean. 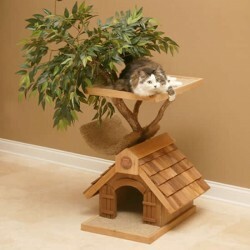 What cat would not want his own treehouse in the livingroom! Bringing the outdoors indoors, this cat tree house delivers. 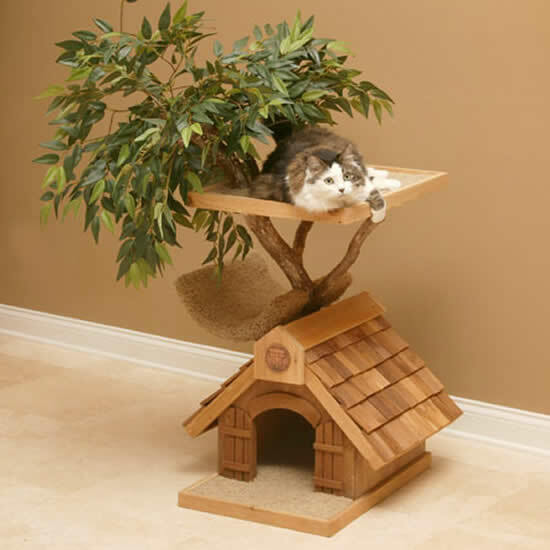 Cats love it and these treehouses come in different sizes and shapes. With the tallest version, you cat can climb up to 7 feet high. There are smaller (and a bit cheaper) versions as well. With even a name that screams design, the Niche Kokon is something else. 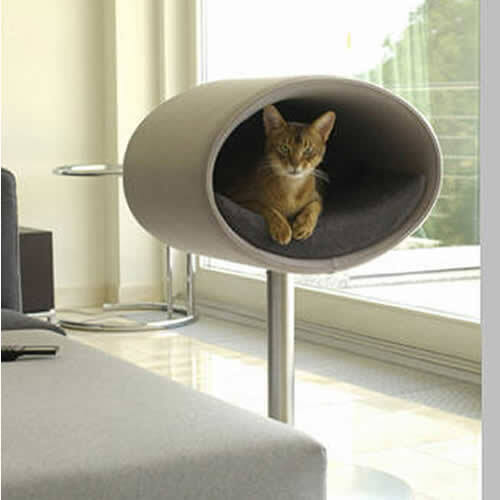 Elegant, design and minimalistic, this cocoon for cats looks amazing. And even better, you have two uses for this furniture piece. A cat house, but also a cat litter box. The backside of the Niche Kokon is removable giving you free access to it. A litter box has never been so stylish before. Although, I would suggest using it as a cuddly cat home, because it’s to beautiful for a litter! 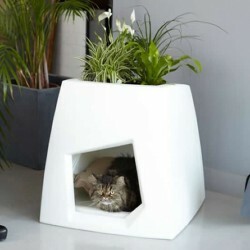 That design objects do not always have to be shiny and square, proves this cat cabin. It looks like something out of a forest, robust and impressive. Four viewing holes and a large, softly padded surface for your cat. 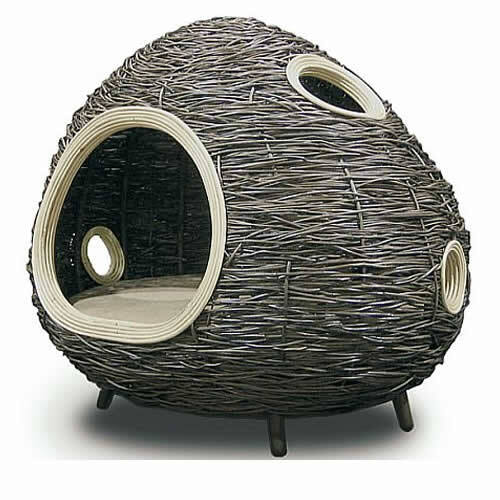 The Cat Cabin’s structure is made entirely out of liana and wood, giving it it’s natural look-and-feel. We all know that cats love high places. 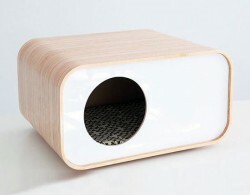 The guys over at 2bmod combined design with cat-preference and came up with the Rondo Stand for cats. The standing base is stainless steel and the design comes in leather, felt and wicker. Even the inner padding can be customized and in different colors. 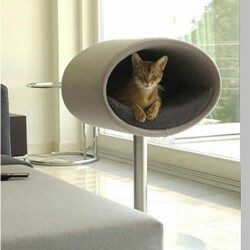 This will be your cat´s new favorite place. 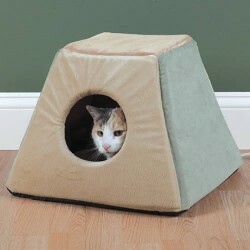 This triangular cat house is enclosed for a safe feel for your cat, and better yet, it is heated! Just plug the heated cat house in and your feline friend will always have a warm place to cuddle up for a nap. The material is made entirely of soft foam and plush fleece, making it super cuddly.